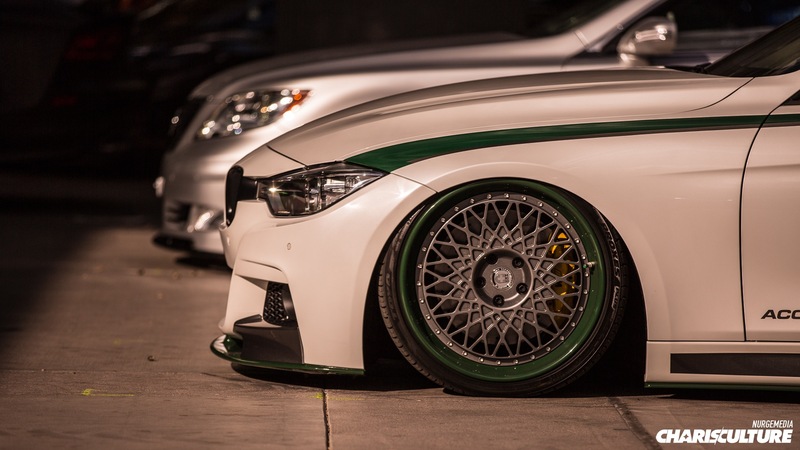 Not too far from there, this BMW wagon sitting on HRE wheels caught our eye. The car belongs to IG user @iamstanchen and goes by the name of #vondoom. This apparently was his first build in fourteen years, and boy he did not disappoint. The car is immaculate (as it should be) to hold its own out here on the West Coast. 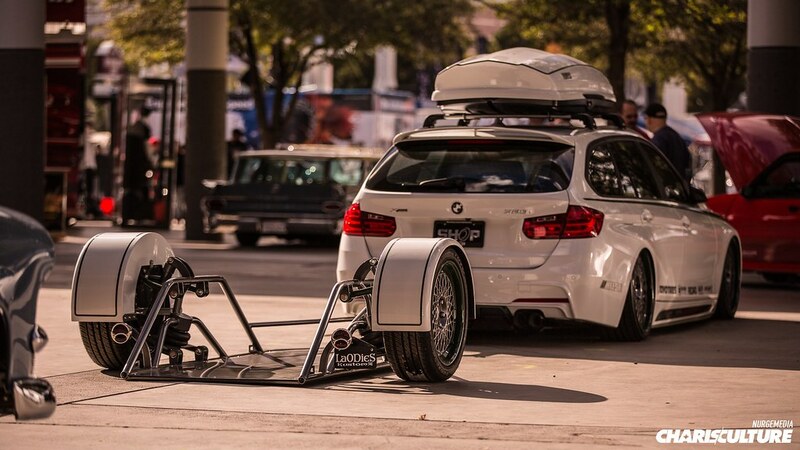 For me, what makes the car awesome is the fact that the trailer is also on HRE wheels and looks better than most cars. Isn’t that something? 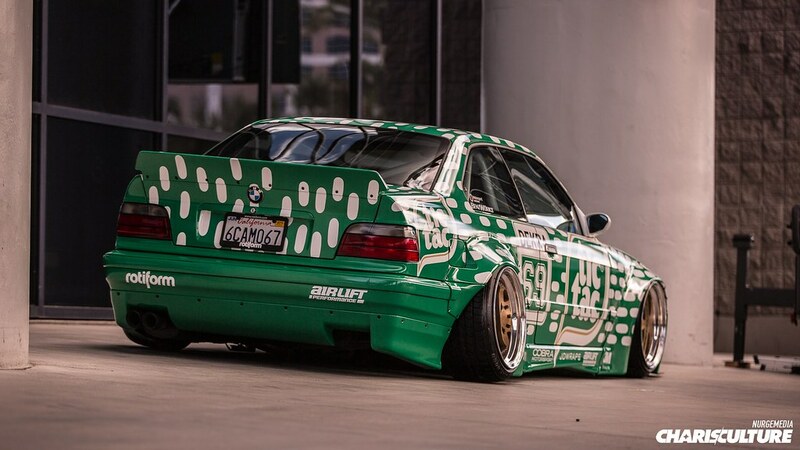 As we wrapped up the day, making our way through before heading to get some grub, we were also pleased to finally see the BMW Rocket Bunny E36. This thing was gorgeous from top to bottom. Purists may cringe when they see the overfenders, but hey, that’s part of the game. Find your canvas and paint it up. There were so many cars lining up. It was pretty ridiculous considering the show does not officially start for another two days, and we were able to get all this in. To keep with the Rocket Bunny theme, this GTR was pretty nuts – from the wing to the rivets, it screamed intensity. We started walking back and making ground. 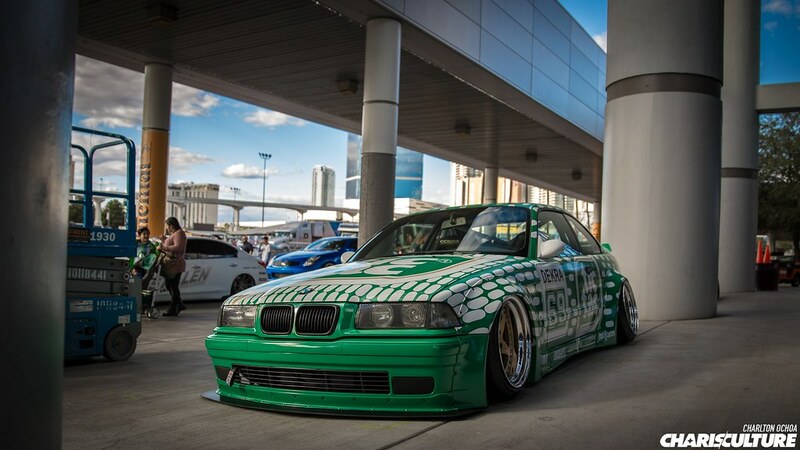 We, of course, revisited some beautiful rides, such as this slammed 740il on HRE wheels. If you thought the overfender game was only for imports, you were wrong. This Mustang came through sporting an aggressive offset looking quite stunning. Back to the beginning before we left, we found ourselves around more cars. We just could not stop taking pictures of them. Check out this RHD Rocket Bunny S15. We kept trying to leave but kept noticing more and more details, and the lighting just kept getting better! These rat rods were plain nuts – big turbos, amazing detail, slammed and rusted out. This is possibly the most unique combination you can find. The cars were built by welderUp, one had a 4bt and the other had a 6BT, badass. And Anthony De Guzman with his super clean RHD MKIV Toyota Supra. If you are at SEMA, you will see all you need to vote. Check out http://tunerbattlegrounds.com for more information. That about settles it for today. As you can see, there was quite the variety – from race cars to full blown classics. There’s something for everyone, and we are excited to get the show started. To stay on top of the action, please make sure to follow us on Instagram for hourly updates, and check out our Flickr gallery here for even more photos!